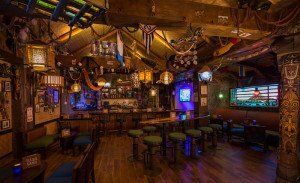 This week’s big news is the opening of Trader Sam’s Grog Grotto at Disney’s Polynesian Village Resort. There are also updates on Miami Cocktail Week, Tales of the Cocktail tickets, and a new mug from Kevin Kidney. Plus: Montreal loses a classic Tiki venue, while Milwaukee may be gaining one. 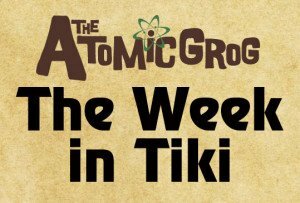 Weekly features spotlight artist Tiki Tony, Robert Burr’s Rum Guide, Japanese band Kenny Sasaki & The Tiki Boys, and San Francisco’s historic Tonga Room. 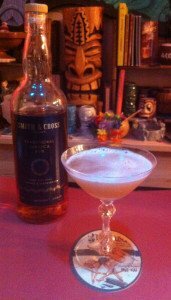 The rum of the week, Smith & Cross, is featured in the Captain’s Blood cocktail. The Disney and Tiki universes collided on Saturday, March 28, to create the perfect storm of excitement at Disney World’s Polynesian Village Resort. Fans and devotees lined up five hours in advance and some waited for more than six for the chance to be among the first to experience Trader Sam’s Grog Grotto. The elaborate bar created by Disney’s famed Imagineers finally held its soft opening Saturday after a week of VIP and cast member previews. The announcement Friday on the Disney Parks Blog ignited the fan frenzy, with many showing up before noon for the 4 p.m. opening. Hundreds were lined up around the resort’s Papatee Bay marina all afternoon. When they reached the front of the line, they were given pagers to alert them when there was space for them in the bar. Some reported waiting three hours to get a pager, then another three to get in the door. Once inside, many enthusiasts who have been waiting for months as news trickled out about Trader Sam’s coming to Disney World just didn’t want to leave. The Grog Grotto seats just 50, and no extra guests are allowed, making the experience as immersive and enjoyable as possible. Another 82 can enjoy the outdoor Tiki Terrace, where the same food and drink menu is available (including all the souvenir mugs). Both stay open until midnight, with the Grog Grotto limited to ages 21 and older after 8 p.m. Also note that hours could be limited during the soft opening as the bar and restaurant are fine-tuned. No official grand opening date has been announced, but it’s expected to be late April. One of the hold-ups is the delayed arrival of the Grog Grotto’s own personalized Tiki mugs. Many of those currently being used and sold are mugs from Trader Sam’s Enchanted Tiki Bar at the Disneyland Hotel. These include the Krakatoa Punch, Uh-Oa! 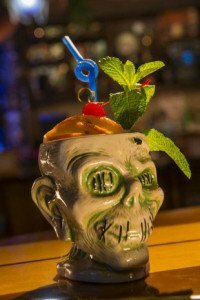 and Shrunken Zombie Head, drinks from the original Trader Sam’s location. Another drink from the West Coast, the HippopotoMai-Tai, is served at the Grog Grotto in a new collectible glass featuring the Polynesian Resort’s logo Tiki icon. You can also pick up Trader Sam’s merchandise (shirts, pins) in the nearby gift shop, Boutiki. After the grand opening, expect to be able to purchase the elaborate Nautilus vessel, which contains the drink inspired by Disney World’s late and lamented 20,000 Leagues Under the Sea attraction. The drink (serving 2) is available now, just not the mug. Other new cocktails created for the Grog Grotto are the Polynesian Pearl (served in a collectible plastic pearl), Castaway Crush, Tahitian Torch and Dark & Tropical Stormy. Non-alcoholic options are Schweitzer Falls, Skipper Sipper, and Polynesian Punch. There’s also a rum flight, a beer flight and a wine list. Most of the cocktails trigger special audio and/or visual effects inside the bar, along with lively cast interaction. The bar and its theming are inspired by such classic Disney attractions as the Jungle Cruise (home of Trader Sam), and the Enchanted Tiki Room, plus Disney World’s beloved Adventurer’s Club (a bar formerly located in Downtown Disney). Some of the decor inside Trader Sam’s Grog Grotto was also inspired by the Polynesian Village Resort, which opened along with the Magic Kingdom in 1971 and was inspired by Walt Disney’s love of the South Seas. In addition to the drinks, there’s an eclectic menu of Polynesian-style small plates: chicken lettuce cups, Hawaiian poke, kalua pork tacos, pan-fried dumplings, roasted chicken and pork pate bahn mi sliders, salmon oshizushi, corn-battered Portuguese sausages, plus a colorful sushi roll. Both the Tiki Terrace and Grog Grotto also set the mood with authentic Tiki and Polynesian music, including a live musician outside. The lighting is dim and inviting, and the cast members very friendly and welcoming. Trader Sam’s promises to be one of the East Coast’s must-see Tiki destinations. The lines have died down a bit, but you should still be prepared to wait for an hour or more during peak times. However, you can easily wait on the Tiki Terrace (if seats are available), the nearby Pineapple Lanai (serving Dole Whips), in the comfy Polynesian Village lobby, or even upstairs at Tambu Lounge. The second annual Miami Rum Fest Cocktail Week, set for April 14-19, will feature events showcasing some of South Florida’s best bars and bartenders, along with tasty rums and cocktails. A full line-up of venues was just announced, including events at Miami Beach’s Regent Cocktail Club (April 15), The Broken Shaker (April 16), and The Rum Line (April 19). 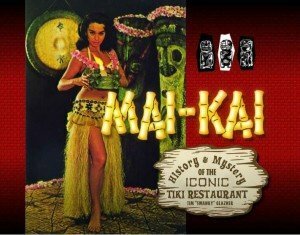 Previously announced was the annual Tiki Night at The Mai-Kai on Tuesday, April 14. See the full schedule and get updates at MiamiCocktailWeek.com. Also be sure to get your advance tickets for the daily Miami Rum Renaissance Festival events – including seminars and the opportunity to taste hundreds of rums – set for April 17-19 at the Doubletree by Hilton Miami Airport Convention Center. After 30 years, Montreal’s Jardin Tiki has closed and is scheduled to be demolished to make way for new development. Jardin Tiki was built in a massive space in a mid-century building that was formerly a car dealership. 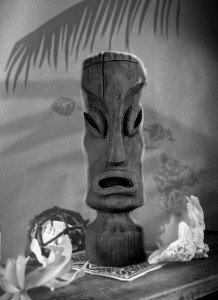 Its owner came from the Montreal outpost of the Kon-Tiki (closed in 1981), as did much of its decor. Jardin Tiki’s distinctive features included bridges that crossed pools stocked with turtles. While the loss of classic Tiki establishments can’t be easily written off, it’s encouraging to hear about new venues opening around the country. In Milwaukee, a bar and restaurant called Wauwatiki is being planned with island-style cuisine and “standard” Tiki cocktails, according to a story on OnlineMilwaukee.com. Drinks will be served in Tiki mugs or specialty glasses, and a large Tiki will be stationed outside, the story says. It appears to be a large space, with two full-service bars and a wrap-around deck and patio in the plans. The owners say they hope to open as early as June. 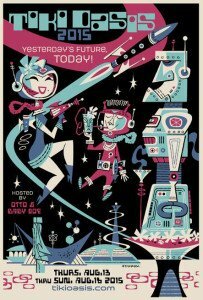 Tickets for Tales of the Cocktail in New Orleans are now on sale. Many of the seminars and events sell out quickly, so it’s a good idea to make your plans now for the July 15-19 gathering that features the top cocktail experts from around the world. There are more than 200 events – including tastings, product launches, competitions, networking events and more – developed specifically for bartenders, distillers and other spirits professionals on the schedule. Due to popular demand, artist Kevin Kidney is joining forces with Munktiki to produce a limited-edition Tiki mug based on the icon featured in the 1959-1963 TV show Hawaiian Eye. Each of the 100 mugs is cast by hand and individually glazed to mimic the texture of palm wood. Mugs also come with the recipe for the Hawaiian Eye Cocktail, created for the show’s cast in the 1960s. 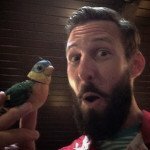 Kevin is an art director, illustrator, writer, show designer, sculptor, puppeteer, and longtime contributor to both the Disney and modern Tiki canons. His mug designs have been featured at The Hukilau in Fort Lauderdale, and he’ll be joining partner and fellow Disney artist Jody Daily at the 2015 event in June to present a symposium titled “Prefeb Paradise” on the origins and design of Disney Polynesian Village Resort. Tickets are on sale now. This California-based artist’s mediums of choice are simple wood and clay, but his artwork has surprising depth and playful motifs that make make them perfect in any Tiki environment. His carvings, paintings, mugs and other pieces are simultaneously vintage and modern, and his drawings evoke a primitive yet sophisticated vibe. Tony’s work can be found in both Trader Sam’s locations in Disneyland and Disney World, plus other Tiki locations around the country. You can catch Tony at The Hukilau in Fort Lauderdale on June 10-14, showing off and selling mugs, paintings, and small carvings in the Tiki Treasures Bazaar. Robert Burr is more than a rum evangelist. He’s created an entire demonination. The Miami based spirits expert runs one of the world’s top rum events (the annual Miami Rum Festival), hosts a rum-focused Caribbean cruise, and writes about cane spirits as the National Rum Examiner. Burr is a world traveler, always seeking out the finest rums to stock his voluminous home bar. But perhaps his most useful gift to the rum world is one of the genre’s bibles, Rob’s Rum Guide, an encyclopedic online resource with notes and reviews of hundreds of fine rums. It’s a useful guide for newbies and seasoned drinkers alike. There’s also a printed edition with a free downloadable PDF available on the site. Influenced by the exotic masters, along with more modern styles such as surf rock, Japan’s Kenny Sasaki has created a growing body of work that fits perfectly into any Tiki bar or lounge. Sasaki, a seasoned musician with decades of experience, released his first exotica album under the Tiki Boys moniker, Tiki Moon, in 2002. 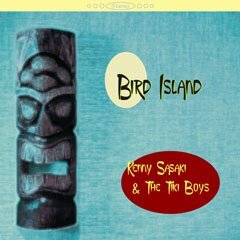 The band’s fourth album, Bird Island, was released in April 2014 and features such standout tracks as The Undercover Man, Surfin’ With the Devil, Spider, and Twilight Lagoon. One of the oldest, most historic Tiki bars from the mid-century still standing, San Francisco’s Tonga Room & Hurricane Bar is also one of the most distinctive. Located in the basement of the The Fairmont hotel, it was built in 1945 in the former location of an indoor 75-foot swimming pool constructed in 1929 (the landmark hotel dates back to 1907). Part of the pool remains in the Tonga Room, serving as a lagoon that features a band performing on a floating barge. A simulated thunderstorm drops rainfall into the pool every 30 minutes. The original restaurant was designed by an MGM set director, and it remains just as fresh and exotic after a recent $1 million restoration. The cocktail menu was also overhauled in 2013, bringing it up to modern standards. Don’t miss happy hour, which runs from 5 to 7 p.m. Wednesdays through Fridays. The restaurant menu offers a wide variety of Pacific Rim cuisine, including Hawaiian specialties. Strictly speaking, this fabulously funky Navy-strength (114 proof) nectar of the gods has been on the market for just five years, thanks to London’s Hayman Distillers and importers Haus Alpenz. But the legacy of this “London Dock” style of Jamaican rum goes all the way back to the late 1700s and England’s oldest producers of spirits, Smith & Tyers and White Cross. Smith & Cross is produced at Jamaica’s Hampden Estate using 100 percent pot stills, making it extremely pungent in both taste and aroma. It’s bold and exotic, spicy yet smooth, with caramel and tropical fruit overtones. Smith & Cross was No. 5 in The Atomic Grog’s rum rankings in August 2013. Shake with ice cubes and strain into a cocktail glass. There are many variations of the Captain’s Blood, most containing dark Jamaican rum, lime, a sugar syrup and bitters. But this version takes things a step further with honey and falernum adding additional sweet and spicy elements. That helps when you add Smith & Cross Traditional Jamaica Rum to the mix to create a deadly drink worthy of its name. While technically not a dark rum, this powerful pot still blend elevates this drink into a funky and fiery small sipper. Add a little more honey mix (equal parts honey and water, mixed) and/or falernum (a potent almond, ginger, clove and lime syrup) if needed to offset the high-octane Smith & Cross, which is a great secret weapon in Tiki cocktails when used with restraint. Another tasty option is to go with 3/4 ounce of Smith & Cross and 3/4 ounce of El Dorado 12, last week’s featured rum. This entry was posted in Art, Cocktails, Culture, Disney World, Events, History, Music, Other Florida, Recipes, Resorts, Restaurants, Reviews, Rum, Rum festivals, South Florida, The Week in Tiki, Tiki mugs and tagged Captain’s Blood, cocktails, Disney World, Kenny Sasaki, Kevin Kidney, Miami Rum Renaissance Festival, Polynesian Resort, recipe, Robert Burr, Robert Burr's Rum Guide, rum, Smith & Cross, Tiki Tony, Tonga Room, Trader Sam's, Walt Disney World. Bookmark the permalink.